The Text and the Scholium. A chronicle which enumerates thirty-five eventful days on which the Jewish nation either performed glorious deeds or witnessed joyful events. These days were celebrated as feast-days. Public mourning was forbidden on fourteen of them, and public fasting on all. In most of the editions this chronicle consists of two parts, which are distinct in language and in form, namely: (1) the text or the Megillat Ta'anit proper, written in Aramaic and containing merely brief outlines in concise style; (2) scholia or commentaries on the text, written in Hebrew. The days are enumerated, not in the chronological order of the events they commemorate, but in the sequence of the calendar, the Megillat Ta'anit being divided into twelve chapters, corresponding to the months of the year. Each chapter contains the memorial days of a single month, the first chapter dealing with those of the first month, Nisan, and so on to the twelfth chapter, which treats of those of the twelfth month, Adar. The festal occasions which these days were intended to keep alive in the memory of the people belong to different epochs; and on this basis the days may be divided into five groups, namely: (1) pre-Maccabean; (2) Hasmonean; (3) ante-Sadducean; (4) ante-Roman; and (5) of the Diaspora, the last-named comprising memorial days admitted after the destruction of the Temple. There are also a few days which do not refer to any known historical event, and are, therefore, chronologically uncertain. These memorial days did not become festivals by being incorporated and recorded in the Megillat Ta'anit, as J. Schmilg has attempted to prove ("Ueber die Entstehung und den Historischen Werth des Siegeskalenders Megillat Ta'anit," pp. 11-20), but had been known and celebrated by the people long before that time, as he himself is obliged to admit in the case of some of them; indeed, the celebration of these festivals or semi-festivals evidently existed as early as the time of Judith (Judith viii. 6). The compilers of the Megillat Ta'anit merely listed the memorial days and at the same time determined that the less important should be celebrated by a mere suspension of fasting, while public mourning was to be forbidden on the more important ones. In an old baraita (Shab. 13b) the question as to the authorship of the work is answered as follows: "Hananiah b. Hezekiah of the Garon family, together with a number of others who had assembled for a synod at his house, compiled the Megillat Ta'anit." According to an account in the "Halakot Gedolot, Hilkot Soferim" (ed. Vienna, p. 104; ed. Zolkiev, p. 82c), the members of this synod were the "Ziḳne Bet Shammai" and "Ziḳne Bet Hillel," the eldest pupils of Shammai and Hillel. The Megillat Ta'anit must have been composed, therefore, about the year 7 of the common era, when Judea was made a Roman province to the great indignation of the Jews (comp. Schmilg, l.c. pp. 20-36). This calendar of victories was intended to fan the spark of liberty among the people and to fill them with confidence and courage by reminding them of the victories of the Maccabees and the divine aid vouchsafed to the Jewish nation against the heathen. The scholium to Megillat Ta'anit, xii., end, evidently quoting an old baraita, says: "Eleazar b. Hananiah of the family of Garon together with his followers compiled the Megillat Ta'anit." This Eleazar is identical with the Zealot general Eleazar, who took a noteworthy part in the beginning of therevolt against the Romans, vanquishing the garrison at Jerusalem, as well as Agrippa's troops, and Menahem's Sicarian bands. According to this account, therefore, the Megillat Ta'anit was composed by the Zealots after the year 66 of the common era, during the revolution (Grätz, "Gesch." iii., note 26), although it is not necessary to correct the Talmudic account to agree with the scholium, and to read, as does Grätz, in Shab. 13b, "Eleazar b. Hananiah," instead of "Hananiah." On the other hand, the view of Schmilg (l.c.) that the scholium is incorrect is erroneous, since there is both internal and external evidence in favor of its authenticity. The account in the Talmud and that in the scholium may both be accepted, since not only Hananiah the father, but also Eleazar the son, contributed to the compilation of the work. Eleazar, one of the central figures in the war against the Romans, endeavored to strengthen the national consciousness of his people by continuing his father's work, and increased the number of memorial days in the collection, to remind the people how God had always helped them and had given them the victory over external and internal enemies. Eleazar did not, however, complete the work, and several days were subsequently added to the list which was definitely closed in Usha, as is proved by the fact that the 12th of Adar is designated as "Trajan's Day," and the 29th of that month as "the day on which the persecutions of Hadrian ceased" (comp. Brann in "Monatsschrift," 1876, p. 379). Furthermore, R. Simon b. Gamaliel, who was nasi at Usha, says in the baraita Shab. 13b: "If we should turn all the days on which we have been saved from some danger into holidays, and list them in the Megillat Ta'anit, we could not satisfy ourselves; for we should be obliged to turn nearly every day into a festival" (comp. Rashi ad loc.). This sentence clearly indicates that the work was definitely completed at Usha in the time of R. Simon, in order that no further memorial days might be added. The Hebrew commentary on the Megillat Ta'anit was written much later, the author, who did not live earlier than the seventh century, having before him the text of both the Talmudim as well as that of Bereshit Rabbah (comp. Brann, l.c. pp. 410-418, 445-451). 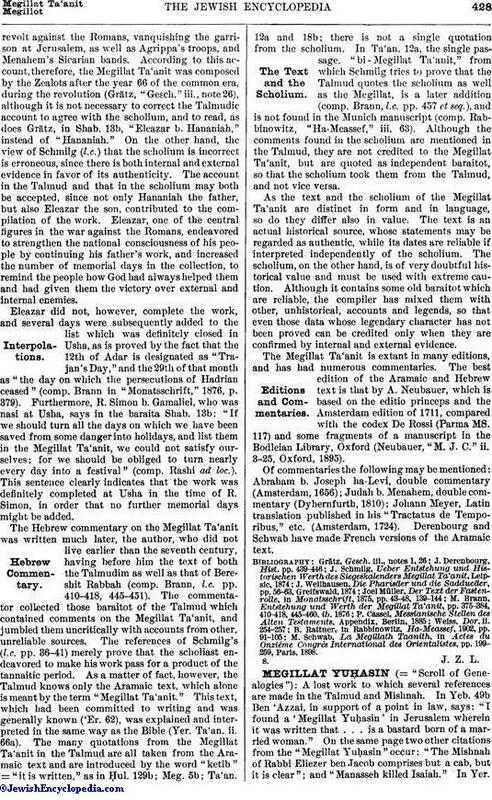 The commentator collected those baraitot of the Talmud which contained comments on the Megillat Ta'anit, and jumbled them uncritically with accounts from other, unreliable sources. The references of Schmilg's (l.c. pp. 36-41) merely prove that the scholiast endeavored to make his work pass for a product of the tannaitic period. As a matter of fact, however, the Talmud knows only the Aramaic text, which alone is meant by the term "Megillat Ta'anit." This text, which had been committed to writing and was generally known ('Er. 62), was explained and interpreted in the same way as the Bible (Yer. Ta'an. ii. 66a). The many quotations from the Megillat Ta'anit in the Talmud are all taken from the Aramaic text and are introduced by the word "ketib" = "it is written," as in Ḥul. 129b; Meg. 5b; Ta'an. 12a and 18b; there is not a single quotation from the scholium. In Ta'an. 12a, the single passage, "bi-Megillat Ta'anit," from which Schmilg tries to prove that the Talmud quotes the scholium as well as the Megillat, is a later addition (comp. Brann, l.c. pp. 457 et seq. ), and is not found in the Munich manuscript (comp. 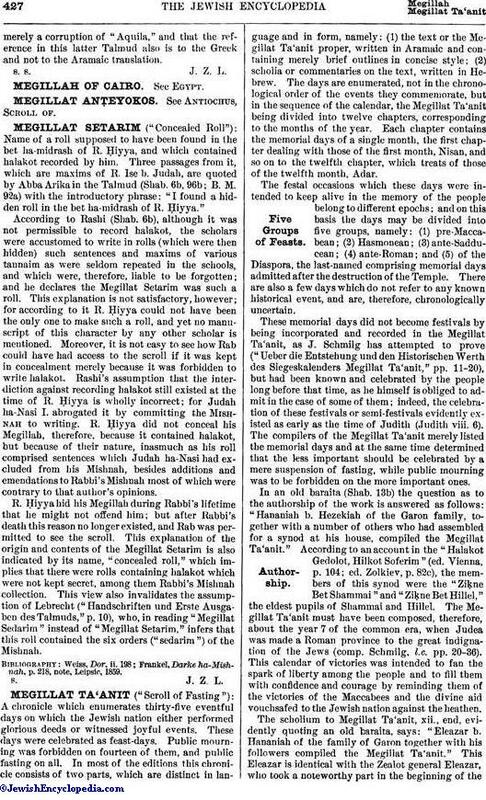 Rabbinowitz, "Ha-Meassef," iii. 63). Although the comments found in the scholium are mentioned in the Talmud, they are not credited to the Megillat Ta'anit, but are quoted as independent baraitot, so that the scholium took them from the Talmud, and not vice versa. As the text and the scholium of the Megillat Ta'anit are distinct in form and in language, so do they differ also in value. The text is an actual historical source, whose statements may be regarded as authentic, while its dates are reliable if interpreted independently of the scholium. The scholium, on the other hand, is of very doubtful historical value and must be used with extreme caution. Although it contains some old baraitot which are reliable, the compiler has mixed them with other, unhistorical, accounts and legends, so that even those data whose legendary character has not been proved can be credited only when they are confirmed by internal and external evidence. The Megillat Ta'anit is extant in many editions, and has had numerous commentaries. The best edition of the Aramaic and Hebrew text is that by A. Neubauer, which is based on the editio princeps and the Amsterdam edition of 1711, compared with the codex De Rossi (Parma MS. 117) and some fragments of a manuscript in the Bodleian Library, Oxford (Neubauer, "M. J. C." ii. 3-25, Oxford, 1895). Of commentaries the following may be mentioned: Abraham b. Joseph ha-Levi, double commentary (Amsterdam, 1656); Judah b. Menahem, double commentary (Dyhernfurth, 1810); Johann Meyer, Latin translation published in his "Tractatus de Temporibus," etc. (Amsterdam, 1724). Derenbourg and Schwab have made French versions of the Aramaic text. M. Schwab, La Megillath Taanith, in Actes du Onzième Congrès International des Orientalistes, pp. 199-259, Paris, 1898.